What comes to your mind when you think of graffiti? Unfortunately, what comes to mind for many is something negative—vandalism, tagging, crime, drugs. 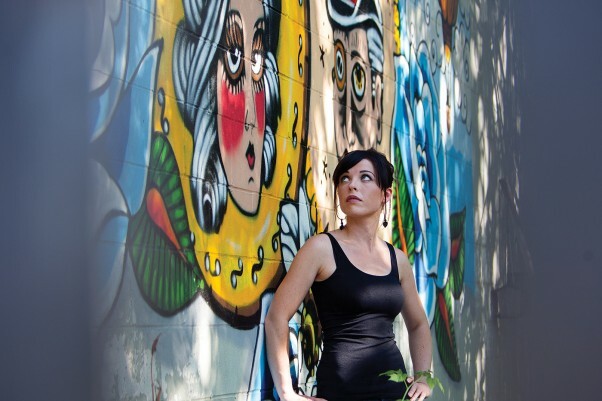 But there is a flip side to graffiti—beautiful, powerful, eye-popping works of art created by a growing segment of professional artists that use spray paint as their medium of choice. 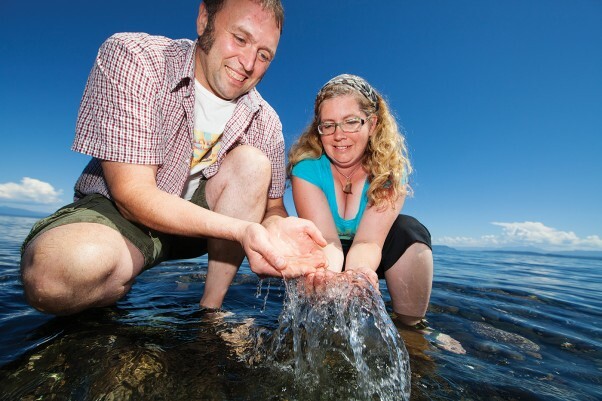 you can enjoy salt straight from the ocean in the Comox Valley. And it’s not just any salt—it’s hand harvested salt that has been gently spiced, or smoked, or even prepared using local wine. 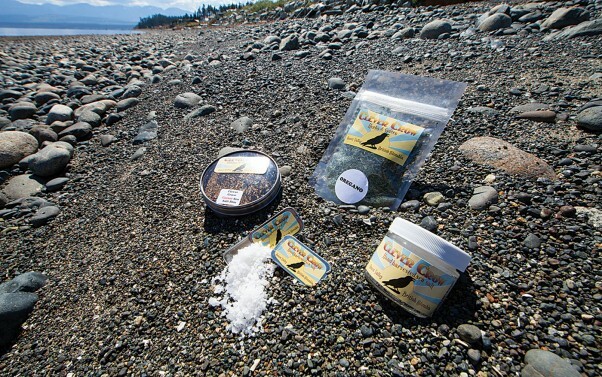 Lia and Brian McCormick operate Clever Crow – Hand Harvested Sea Salt, Herbs, and Spices. They started hand harvesting their specialty salts last October, from bays just north of Courtenay up to Campbell River. “We’re always trying different spots,” says Lia. While regular table salt has been boycotted by many households, traditional and natural sea salt has been increasing in popularity due to the recognition of its many health benefits. Natural sea salt contains trace minerals and is actually a very healthy addition to our diets. The process of creating their specialty sea salts begins when the McCormicks collect 20 litres of water from the ocean in large plastic food grade pails. Once back at their quaint Courtenay home, which is brimming with lush green gardens, the sea water will sit for one or two days so that anything heavy can settle out. The water is then filtered by electric pump through screens to remove all remaining particles. So begins the process of rapidly boiling 80 litres of ocean water down to 15 litres. During the boiling stage, a mineral called gypsum starts to accumulate on the side of the pots, and this is removed due to its chalky taste. As the salt content reaches a high concentration, the water is then moved into crock pots where the water continues to be heated until salt crystals begin to form. “It’s sort of funny to say, ‘Oh, we do it in crock pots,’ but that’s our small scale way to do it right now, because the temperature is low enough, and we can leave it on all day,” says Lia. In her kitchen, a counter top full of crock pots waits for the salty water on the stove, which is in two large enamel pots, to complete the first stage of boiling down. As the crystals form they are scooped out and laid to dry. A large glass tray full of what looks to be heaping snowflakes in a magical winter wonderland contrasts the heat of the day and the fact that these flakes are actually drying slowly in the oven. “The last three or four litres of water produce very small crystals,” Lia explains, “which contain a high content of nigari—the salt used in making tofu—and it is quite bitter. We don’t use the small crystals.” Lia will often examine other sea salts in the stores by holding them up to the light and searching for the small yellow bits that indicate the presence of nigari, just to see how their product compares. Once the salt has dried completely the fun begins. The McCormicks take their salt to the kitchens at Prontissima Pasta, where they mix and package their different sea salts. And what a variety there is! A square plate with eight colorful salts in perfect little piles, along with a few of the spiced almonds also made by Clever Crow, and a side dish of sliced cucumbers from the greenhouse to use with the salt, offer a perfect sampling of their products. There is of course the natural sea salt, which has a nice crunch to it and is perfectly white, as well as smoked sea salt, a citrus blend, rosemary, spicy chili, the sea vegetable blend, which uses only Canadian seaweed, a seasonal garlic scape and chive blossom blend, and the Ca Beautage Wine salt, which adds a deep purple red complement to any dish. All of the salt mixtures are created using herbs from the Clever Crow gardens and farm when possible. For example, their newest salt, the garlic scape and chive blossom blend, is a seasonal salt that was produced after the first stage of garlic harvesting in July. The McCormicks lease an acre of land in Dove Creek where all of their herbs are grown. They also grow most of their own food there, and sell produce such as greens, potatoes and beans at the Farmer’s Market alongside their artisan salts. “It’s nice to have room to grow these things that take up so much room,” says Brian of the decision to lease farmland. “They fill up our yard so fast.” One look around their backyard patio and it is easy to see this is true—fennel, tomatoes, herbs and cucumbers fill up the yard and are all but tumbling out of the greenhouse. Among the salts Clever Crow creates is the Citrus Blend, which uses the zest of lemons and limes, has a lovely yellow color, and is suggested for salmon and scallops. It is one of the few salts that is not 100 per cent local. “The flavor comes out more in oil or on hot fish,” says Brian. Another popular product is their smoked sea salt, which is created after smoking the salt in a smoker for six or seven hours using a special blend of wood. This produces a grey salt with a unique smoked flavor that happens to be Lia’s favorite. The Rosemary salt—Brian’s favorite—uses Clever Crow’s rosemary, which is air dried and then coarsely ground, and similarly the Chili Salt is created by grinding dried hot red chili peppers grown in the greenhouse. This salt varies in color from orange to pink to red, and a suggested use is with butter and lime juice on corn on the cob. The Chili Salt is also used on Clever Crow Spicy Almonds, the only snack food available at this time. “In Canada, everything’s been so homogenized” adds Brian. “There are no regionally unique foods [aside from some cheeses], especially on the West Coast.” Brian, who loves gardening, would like to move into curing his own meats using the Clever Crow sea salts. Part of the vision of Clever Crow was to create a regionally specific food—not a surprising ambition considering the couples’ recent endeavors in the Valley. Lia and Brian moved here 18 years ago, and in 1996 they bought the Bar None Café, a small vegetarian bistro, which they owned for 7 years. “It drew people from all walks of life,” says Lia. “There were always interesting discussions happening, we had an open jam night, and we even published a cookbook. “It’s been closed for almost 13 years and not a day goes by that people won’t mention it to us,” she adds, noting that through the café they established great relationships with local farmers. After leaving the Bar None behind, Brian worked closely with Locals Chef Ronald St.Pierre at the Kingfisher. When the award-winning Chef St. Pierre decided to open his own restaurant—Locals— Brian moved with him and worked as his sous chef for two years before deciding to take some time to explore his own path. Lia also works at Locals and has been there since it opened five years ago. The couple reflects on the fact that this is a little tricky because the parts would have to be non corrosive, or perhaps they would need to find a desalinator, which runs about $5,000. Yet the desire to keep it small scale and local is strong.